The history of the Christmas carol extends back to the Middle Ages, producing a rich tradition over centuries which continues to the modern era. 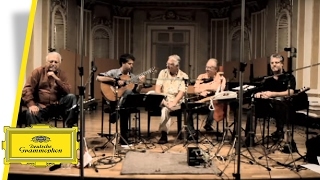 This selection of new and familiar Christmas music presents the genre in unique musical colours featuring the world’s foremost guitar ensemble, Los Romeros, playing arrangements for four guitars and in company with the orchestra, the Concerto Málaga, directed by conductor and composer, Massimo Paris. This extraordinary family of musicians, known as Los Romeros, has been a powerful presence on the international concert platform for nearly five decades. When Los Romeros made their first European tour in 1969/70, they were described by an ecstatic press as “Segovia times four”, “the Paganinis”, and “the royal family of the guitar”. The patriarch of the family, Celedonio Romero (1913–1996), emigrated to the USA in 1957 with his young sons Celin (b. 1936), Pepe (b. 1944) and Angel (b. 1946). Celedonio taught his talented children from an early age to play the guitar, the result being a remarkable family saga which has ensured for itself a permanent place in the pantheon of guitar history. The music of Los Romeros goes on through the generations as Angel Romero’s son, Lito, has joined the ensemble following the death of Celedonio, while Celino (Celin’s son) replaced Angel in the quartet in 1990 when his uncle decided to concentrate on his solo career. In all, seven of Celedonio’s grandchildren play the guitar. However, Pepe Jr. has acquired an international reputation as a maker of guitars, having studied the craft in Germany and elsewhere. Thus Los Romeros have become a legend of guitar virtuosity and artistic integrity, whether as members of the renowned ensemble or as soloists in their own right. In February 2000, King Juan Carlos of Spain awarded the family a collective knighthood in the form of the Grand Cross of the Order of Isabella the Catholic. Among their hundreds of concerts, Los Romeros have performed at the White House and the Vatican, for Prince Charles, Queen Sofía of Spain and Queen Beatrix of the Netherlands, and have appeared with the world’s leading orchestras. Many fine works have been written for them, including concertos by Joaquín Rodrigo and Federico Moreno Torroba. Each culture has its own approach to the concept of carols, the international nature of the form bringing together a vast array of diverse characteristics. Though carols may express similar religious sentiments, various musical idioms are available ranging from straightforward folk melodies sparsely harmonized to intricately woven large-scale compositions. On this recording the more traditional carols are interpreted through the vibrant sounds of the guitar quartet itself – the incomparable ensemble playing of Los Romeros. In this context, familiar items such as Away in a Manger, Silent Night, El Noi de la Mare, Carol of the Bells, The Little Drummer Boy, etc., take on a new and highly charged significance, the intricate sonorities being presented with appropriately intimate artistry, as well as a sense of spontaneity and freshness. Where the guitars are accompanied by the orchestra in Handel’s “For unto us a Child is born” and the “Hallelujah” chorus, the listener may well experience the sensation of discovering a Baroque concerto, combining brilliance with symmetry. In the two arrangements of Ave Maria (by Schubert and Gounod respectively), familiar works take on excitingly different perspectives, the guitar ensemble being one of the most flexibly expressive combinations, especially when matched with superb orchestral accompaniments. Included on this recording is also a recent work, the X’mas Suite by Massimo Paris, Italian composer, conductor and virtuoso viola player, who in 2003 was appointed conductor and artistic director of the orchestra, Concerto Málaga. Maestro Paris’s solution to the problem of composing contemporary carols is to bring together evocative themes in four movements with traditional tonalities, the fifth being a fiery saltarello, a celebratory dance which pays homage to past customs and the demands of the 21st century. The composer skilfully integrates the ensemble expertise of Los Romeros with subtle orchestral textures, both parties complementing the other in accordance with the distinct moods of each movement of the suite. As may seem appropriate, Los Romeros are permitted the final statement, a rendering of O Christmas Tree, from the German carol O Tannenbaum, based on an ancient folk tune, and a gently contrapuntal approach to We Wish You a Merry Christmas, a carol which originated in 16th-century England. The poised assurance of Los Romeros, the harvest of so many decades in the musical spotlight, brings to these lovely carols an enhanced beauty and meaning.